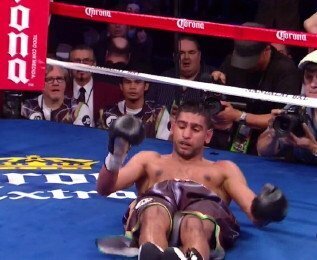 Now that it seems that divine intervention and salt water has healed Manny Pacquiao’s shoulder, Britain’s Amir Khan has decided to ramp up his case for landing a fight with the Filipino superstar and says he will happily copy the Floyd Mayweather blueprint to try and get the job done. “To win a fight against someone like Pacquiao, the key is speed, movement and distance and that’s how Mayweather beat him,” he told Dubai 103.8, regarding any fight with his former Wild Card stablemate, who incidentally, will turn 37 in December. Quite why Khan still rates himself so highly is unclear as he is still yet to face a genuine 147 lb-er since moving up to welterweight two and half years ago, and (Alexander aside) he hasn’t beaten anyone relevant and not past best since his thriller with Marcos Maidana in 2010. He also hasn’t boxed anyone who could punch since Danny Garcia knocked him out and took his WBA 140 lb strap in July 2012. Many fans in Britain remain desperate to see Khan fight IBF welterweight champion Kell Brook in a stadium super fight, although he still stubbornly refuses to do so, insisting that the Sheffield based champion hasn’t “proved himself” like he believes he has against world class opposition. “Floyd beat him by being sneaky and he made it look so easy. Floyd makes beating almost everybody look easy and one would think Khan is foolish to think he can emulate any Mayweather blueprint for his own potential fight against Pacquiao, irrespective of his best assets, which are hand speed and movement. It might be worth noting that Chris Algieri was floored 6 times by Pacquiao last December, while the New Yorker gave Khan all sorts of bother in his very next fight in May of this year. Even though Pacquiao hasn’t scored a knockout since his classic with Miguel Cotto in 2009, one would still assume he would only have to catch Khan the once around his notoriously fragile whiskers to turn his lights out. Top Rank’s Bob Arum, himself slightly upset with Pacquiao missing rehab, last week said in the Telgraph.co.uk that he can make Khan’s new dream of a Pacquiao fight a reality. “This kid Amir Khan keeps shooting his mouth off about Manny Pacquiao. I can arrange for Khan to fight Pacquiao. “Amir Khan has been begging Mayweather for a fight and now he can get a major fight. I’m not a hard guy to deal with. I’m not going to mess them around,” the Top Rank chief said. Khan, who has reportedly become upset with advisor Al Haymon in the wake of not landing the Floyd fight, has also been ignoring calls from Florida’s WBA (reg) welterweight champion and fellow Haymon client Keith Thurman, who is extremely keen to get his hard hitting hands on the Brit. The Bolton fighter – rarely in a boring fight – has been put down numerous times throughout his career and was famously brutalized inside a round by Breidis Prescott in 2008, although rebounded when gifted a shot at then WBA 140 lb champ Andriy Kotelnik less than a year later.